A poster of this hangs in the weight room of our gym. I sort of want it. I have wanted to focus on working my chest specifically; & fortunately I have a husband willing to step in as my lifting partner a couple days a week & create really solid workouts for us. The following are last week’s; if you like feeling worked through your pecs, you’ll enjoy these, especially #2, which was really felt the next day. Alternate between 1 & 2 each set; as well as 3 & 4 each set — so do 20 DB Press, then 20 Rows, short break, then 20 DB Press, 20 Rows, etc. Adjust weight according to your own abilities. Are you a woman who likes to work her chest or does it make you nervous? I love ending with pushups to fatigue. 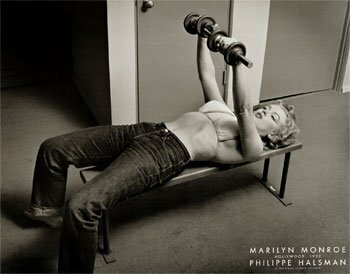 It always kills my chest 🙂 I’ve never seen that photo of Marilyn but love it! OK I love that photo! I’ve never seen Marilyn in that way before! I know! Isn’t it great? I was slightly obsessed with Marilyn growing up. You are currently reading I Want Pecs at ARoadMoreBalanced.